Scene-1: The location is a modest rooftop in the town of Agra. A coir bed is laid. The winter sun is shining brightly. A simple and pious lady wearing a saree is lovingly looking at me with oil in her hands. She is looking beautiful with the sunlight caught in her hair and the smile lighting up her face. She takes one good look and then starts massaging the warm oil delicately on my arms and legs. I was a baby then. These are my first memories of my dearest nanima. Ever since that day on the rooftop, the love, care and affection she has showered generously has only increased exponentially. For her, her children and grandchildren have always been the first priority. In our health and well-being, lies her happiness. Scene-2: The summer holidays are here. We go to Agra. We meet our cousins. We play in the garden. We run around the house. The sun sets. The electricity is gone. We all sit together in the candle light. Nanima starts singing. We follow her lead. She teaches us ‘Bhajans’ and also a lot of old evergreen movie songs. Nanima starts dancing. We follow her lead. She tells us stories. The stories always had a good moral and a happy ending. She taught us to be better human beings. She taught us to how to enjoy life. She taught us a lot many things. She has always been a teacher, and a really good one. Scene-3: I am sitting in the ‘aangan’ planning our next ‘baccha party’ show. Nanima comes to me and asks if I like ‘samosas’. I say I love them. She smiles and goes into the kitchen. She comes out carrying a tray with a lot of potatoes and two knives. She hands me a knife and tells me to start peeling. She slowly shows me how. Together we make ‘samosas’ and talk and laugh. Scene-4: Many years have gone by. I am in her room. She is telling me her story. She tells me about the obstacles, the difficulties, the suffering. A working woman’s life is tough, she has to make many sacrifices and she has to fight many fights. She has to take intelligent decisions at every step in her life. Prof. Pratima Asthana has done all that and much more with her head held high. Her career as a historian has earned respect from a lot of people. The books written by her are read by many and are an inspiration for all. She has written about Indian history, Indian women, role of women in Indian history. She even travelled to Russia all by herself to write about Soviet women. She has worked very hard all her life. She is one woman who truly deserves every ounce of respect that she gets. Scene-5: I have come to visit her in my semester holidays. We talk about God. She tells me to always have faith in one supreme power. You cannot hide anything from him. He is always watching you, listening to your thoughts, looking after you. Scene-6: I am talking to her on phone. She asks about mom, dad, Anshu and Ace. She asks me if everything is running smoothly in my life. We discuss about the projects I am working on. She immediately offers her help. She gives me some very good pointers on the basis of which I am able to further develop my ideas. She is my inspiration, my guide and my idol. I take her blessings before all my endeavours and they automatically become successful. Her brilliance, her magnificence has always amazed me. She is a diva in her own charismatic way. I am so proud of you dear Nanima and I hope someday I give you a reason to be proud of me too. This article was published in the book “Apratim – The Saga of Womanhood” which has been compiled in honour of Prof. Pratima Asthana. The book was launched on her 75th Birthday (January 3rd 2011). Prof. Asthana is the former vice-chancellor of Gorakhpur University and a renowned historian. 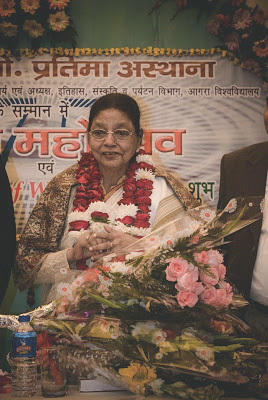 She currently lives in Agra with her son Prof. Sugam Anand and his family.